"Mary," my mother calls from the path in front of our home on the outskirts of Nazareth, "we'll be back in a while. Make sure you finish the mending." Her voice trails off as she and my little sisters head for market. It's finally quiet. Of course, father and the boys left for the fields hours ago. And now I'm alone, gloriously alone. Alone with my thoughts and dreams — and the family mending. I hear a step on the threshold and look up. Standing in the doorway is a man, tall — extremely tall — and bright, with a gold sash girding his shining robe. I've never seen him in Nazareth. Who is he? What does he want? He's looking directly at me. 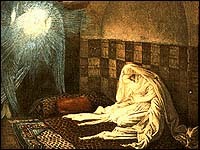 "Shalom, daughter, upon whom the favor of the Lord is resting," he begins. "The Lord is with you!" What kind of greeting is this? Who am I that he should speak to me so? Should I cry for help? Should I climb out the window and run? But I sit paralyzed with my mending still in my lap, needle and thread fallen to the floor. "What brings you to our humble house, good sir?" The words roll out without me even realizing that I am speaking. The man stoops to enter the door, and then, as if to put me at ease, he lowers himself on one knee so his imposing height will seem less intimidating. "Do not be afraid, Mary," he says gently, "You have found favor with God." I have been holding my breath, I realize, but now relax enough to let it out and take another. His next words, however, terrify me. "You will be with child and give birth to a son, and are to give him the name Jesus." Me "with child"? Bear a son? I'm just a girl in my father's house. But he goes on, and it is all I can do to keep up with the words which sound like a formal decree from a king or someone he represents. "... You will give him the name Jesus. He will be great, and will be called Son of the Most High. The Lord God will give him the throne of his father David, and he will reign over the house of Jacob forever; his kingdom will have no end!" The man has finished his message for a moment. I brush the hair away from my face. "How will this be," I stammer, "since I am a virgin?" He must be an angel! The royal manner and presence, the shining garments. I clutch the mending still tighter in my fists. "The Holy Spirit will come upon you," he answers, "and the power of the Most High will overshadow you. So the Holy One to be born will be called the Son of God." He's not talking about my marriage in a year, and a little "Joseph" nine months later. No, he's talking about some kind of miraculous pregnancy, a pregnancy from God Himself. A holy Child who is God's Son, body and spirit. Why me, a peasant's daughter in a hill-country village? Why is God is calling a mother for His holy Son? Why? The angel doesn't answer my whys, but his tone changes from royal herald to gentle explainer. "Did you know that your cousin Elizabeth in Judea is pregnant?" Old Elizabeth, the priest's wife? She must be sixty if she's a day! How amazing! How wonderful! "Yes," he goes on, "though everyone thought she would never have a baby, she's already six months pregnant!" The angel is smiling, and now I am smiling, too. Elizabeth, six months pregnant! What a divine joke on everyone! How happy she must be! I look at the angel once more, but the smile is gone. There is friendliness and warmth, but no smile. "Mary," he assures me, "nothing is impossible with God." Then he is silent, waiting. So I'm to be the mother of the promised Messiah? How can it be? And yet this is God's angel. It must be true! But what about Joseph, dear Joseph who loves me. He could never understand this. He would never believe this. And my mother and father — the village for that matter — how could anyone understand? I don't understand it either, but I find I believe it. Deep within I know that this angel bears me a message directly from God Himself. I glance up again. He is still waiting. No convincing, no arguing, no badgering. Just waiting for an answer to take back to his Lord. "Mary, mother of God's Son." It sounds so strange. I am weeping now, overcome with love for God who is trusting me to carry out this awesome mission for Him. At the same time thoughts rush in to compete for my attention, thoughts of my future, of Joseph, of my parents, and friends. I can't expect anyone to stand by me through this. Can I bear it? I look at my lap. I have twisted my brother's shirt into a tight roll. I unroll it, and try to pat out the wrinkles. Yes! I am willing if God will help me. I look up at the angel and speak quietly but clearly: "I am the Lord's servant. May it be to me as you have said." The angel's face beams, and he rises to his full height. My, he is tall! The sun from the window catches his golden sash for just a moment, and moving sparkles cascade upon the walls and ceiling and floor. Now I hear the sounds of children laughing and glance out the window to see my sisters skipping up the path, my mother a few steps behind them. I motion for the angel to leave quickly, but he is no longer here. The door bursts open, and my giggling sisters scamper into the room, tumbling the market produce from their aprons onto the table. "You seem flushed, girl," mother says. "Are you all right?" "Yes, mother, I'm fine." She looks at the pile of mending, hardly begun, gives me a glare, and then sets about putting away her purchases. "Mother," I say. "Do you remember cousin Elizabeth who lives down in Judea?" "Oh yes, old Bessie. My, but it's been a long time since we've seen her and Zechariah!" "Mother, I'd like to visit her for a little while, if you think that would be okay with father." "Now whatever put that thought in your head?" "We'll see, Mary, we'll see. I'll talk to your father. Now help me cut up these vegetables. Your father and brothers will be back in less than an hour, hungry for their dinner." "Yes, mother. I'll help right away. I ... I am your servant." She stares at me for just a moment, till the barest smile forms at the corners of her mouth, and then hands me the kitchen knife. "Okay, Mary, it's all yours," she says with a touch on the shoulder, and she's out the door calling for my sisters, "Sarah! Margaret! Come help with dinner!" This story is based on the account in Luke 1:26-38.